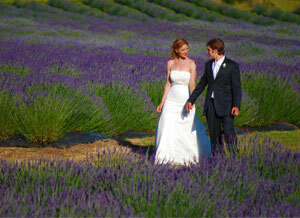 Have you ever wanted to get married in the middle of 25,000 lavender plants? to expansive pastoral, lake and wooded vistas... sunshine warms gentle breezes enveloping you with soft, sweet fragrance... can you imagine your photos taken in such a picturesque locale? Beautiful! If you or someone you know finds this notion attractive (as obviously we do), we would be pleased to welcome your party to the Farm and help you create a unique, memorable and stress-free event. If all this sounds appealing, let us assist you in creating a beautiful event at our Farm. June - August are the best months to be surrounded by fields of blooming lavender....breath deeply! More wedding details & offerings.